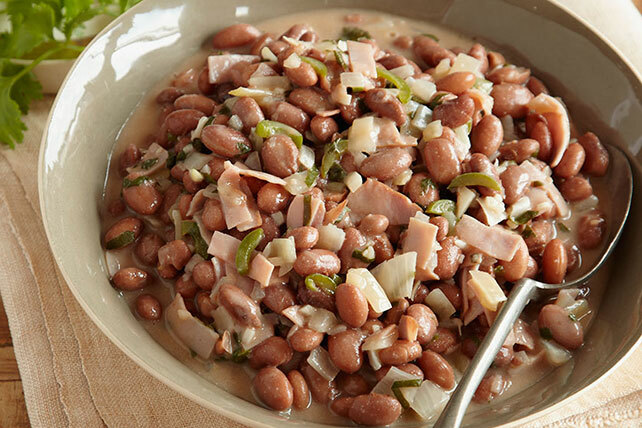 Save time, but don't skimp on spicy serrano flavor with our Quick Pinto Bean Recipe. Enjoy the flavors of this one-pot pinto bean recipe today! Heat oil in large saucepan on medium-high heat. Add next 4 ingredients; cook 3 min., stirring occasionally. Stir in cilantro and mustard; cook 2 min., stirring frequently. Drain 2 cans beans; add to ham mixture. Stir in remaining 2 undrained cans. Bring to boil; cover. Simmer on medium-low heat 10 min., stirring occasionally. Substitute 1 sliced jalapeño pepper for the serrano chiles. Top each serving with 1 tsp. BREAKSTONE'S or KNUDSEN Sour Cream.